Besides the pretty picture, you may be asking yourself what you can learn from a wine label in helping you with your choice. They say never to judge a book by it’s cover but I have to admit that I often pick a wine just by it’s label (and as I admit this, I realize my credibility is dropping). That’s OK! Wine is supposed to be fun! Finding a good bottle is like solving a mystery and it has great rewards. It had to be French. A label typically shows the year the wine was bottled (and generally speaking, the older the wine, the better), the name of the winery, the type of grapes or grape combination used (examples include Merlot, Cabernet Sauvignon, Semillon etc.) and the country of origin. 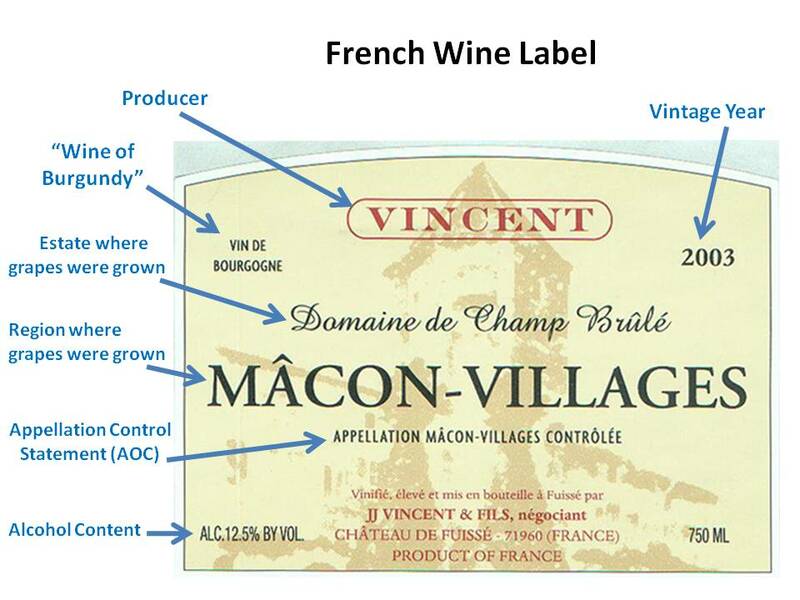 The back label often describes the flavours in the wine and what kind of foods match up well with it. Essentially, the better the match, the more enhanced the flavours of your food will be. See, I told you it could be fun!! Next up: Figuring out the LCBO, SAQ and so forth. So you arrive at your local LCBO/SAQ/WHATHAVEYOU (it appears that I can now rhyme) armed with information on how to read wine bottle labels. You’re raring to go! When you step in the air-conditioned space with its shiny floors and aisles of bottles, you realize that your new-found confidence is no where to be found. The place is a maze. Where to begin? For me, a good starting point is to visit the aisle of the country which is of most interest. In order to bring your confidence back, simply follow the signs that are posted above the shelves. The “big guns” in wine making are California (which is curiously labelled as such, rather than USA), France, Spain and if you live in Ontario there is some shameless self-promotion going on as well. Africa (South Africa to be exact) and Australia are really climbing the ropes along with Chile but if you look carefully, you’ll see vino from almost every country (and certainly from every continent). Once you’ve established which aisle will be your starting point, decide if you are feeling a little red or a little white today. Or perhaps a little of both [which would mean you’d want to look for a rose (pronounced “ros-eh”)]. One you’ve picked the colour in your chosen aisle, you’ll be relieved to know that you are already 50% of the way there when it comes to choosing a bottle! At this point, think about whether you are planning to have this wine with a meal or on it’s own since you’ll probably want something lighter and more “drinkable” if you’re going solo. A lighter meat (such as chicken) or fish dish as well as most vegetarian food typically goes well with white wine. A heavier meat dish or something hearty will typically work better with a red. And if you’re drinking a wine solo, the sky is the limit. But rules are meant to be broken, which is the best thing about modern wine drinking 🙂 I say Pish Posh to obsessive matching! The paper label affixed to the shelves under each set of wine bottles reveals some extra tidbits of information that are not on the bottles themselves. Obviously, the price (and a high price does not a good wine make!) and, most importantly, the sweetness. If you see a zero, the wine is “dry”. If you see a one, it is a little less dry. If you see a 2, it is a mix of tart and sweet. If you see a 3 or even a 4, it is very sweet. You’ll likely notice a few other things on that paper label but none are as important as that magical number as well as the magical number with the dollar sign preceding it. I’ll discuss basic wine terminology in my next post.